You know how summer rolls are kinda sorta totally finicky to roll, those soft Asian rice papers and all? Enter deli turkey, the protein-packed easy-to-roll substitute. (And hey, deli ham works too!) I've rolled these with a mix of red pepper, cucumber, asparagus, avocado and mango but the choices are limited only by your imagination. 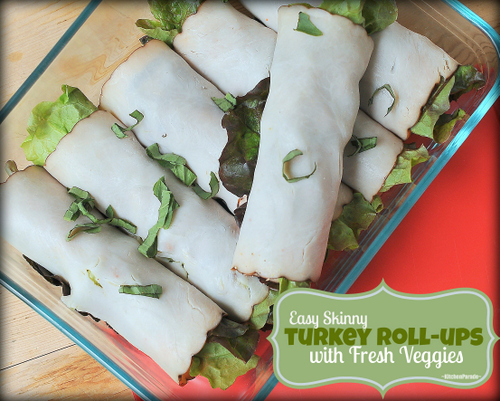 Easy Skinny Turkey Roll-Ups are quick to make with easy on-hand ingredients. Better yet? They're good for you too. Each roll is just 50 calories and very Weight Watchers friendly – and yet totally fresh and filling. I think you'll love these, I know we sure did! Easy Skinny Turkey Roll-ups were one of 2013's "Best Recipes"! Hey! What Happened to Spring?! It seems we were blessed by three whole days of it, Easter Sunday in March, one day in April and another early this week. Then whomp, summer hit and the AC went on. So here it is, mid-May and already it’s full-on summer. The only compensation? I a-d-o-r-e summer food! It’s why I started “Summer Easy” – my collection of easy summer recipes – awhile back. The premise – heavens, the PROMISE – is to spend less time in the kitchen, even while reveling in summer’s best fresh tastes. So hello summer! We’re off to a great start! These Easy Skinny Turkey Roll-ups with Fresh Veggies make a great light lunch, an after-swim snack, an easy bite before dinner. Good picnic food? That too! Working gently, roll the turkey slice starting at the end where the vegetables are. TO MAKE-AHEAD Make 2 – 3 hours ahead, cover and refrigerate. The lettuces goes soft after that. MORE IDEAS Mix a fruity apricot jam with a little horseradish, substitute for the honey mustard. Or use a little cream cheese mixture, even hummus, to avoid sogginess, just be sure it’s not too “wet”. TURKEY Just for fun, I tried different Boars Head deli meats, including deli turkey, deli ham and deli roast beef. The turkey held up the best to rolling, the ham did well too but needs to be slightly thicker. The roast beef was a bust: it just fell apart. Size will make a difference but I found that a slice was “just the right thickness” when it weighed a “generous ounce” – for six rollups, seven ounces was spot-on. MUSTARD No need to buy honey mustard just for this, just mix your own. For six roll-ups, mix about 3 tablespoons Dijon mustard with 2 teaspoons warm honey. LETTUCE Choose lettuce leaves about the same size as the turkey. If the lettuce is wet or even damp, the roll-ups will get soggy in no time. Do take the time to dry well. Take out the ribs, they tear the turkey. VEGGIES Keep the vegetable pieces small and don’t overfill the rolls. Grated zucchini and carrot would work, daikon too. Very diabetic friendly. Perfect for a lunch or picnic. I'm not afraid of spring roll wrappers, but I think these roll ups are a great idea. My kids would love them (with cheese, they love all things with cheese). What do you think about a thin swipe of softened garlic herb cream cheese, like boursin/rondele/alouette type thing on the meat? Yes, it will up the calories, but would it still roll OK.